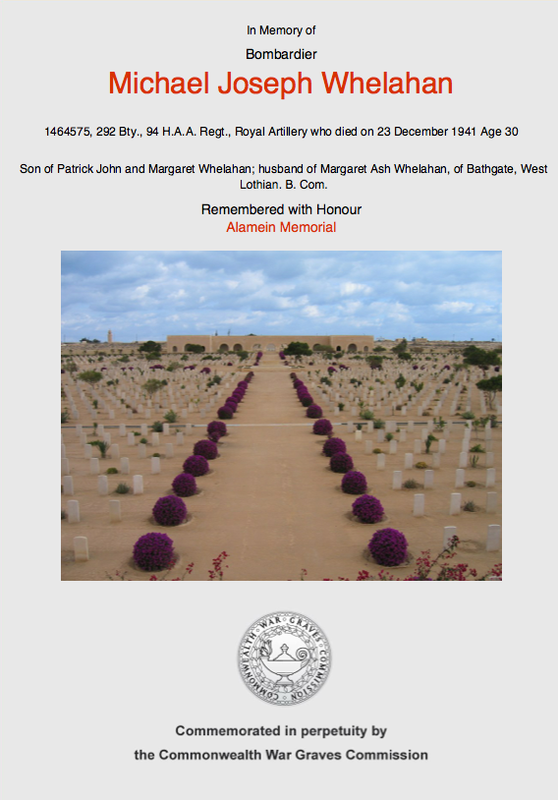 We dedicate this page to the memory of MICHAEL JOSEPH WHELAHAN who died in Action on 23rd December 1941 in North Africa. He is buried at Alamein Memorial Cemetery. Michael Joseph was the son of Patrick John Whelahan and the grandson of Michael Joseph Whelahan. Thanks to our new [cousin] Andrew Kellock, whose wife’s Aunt was married to Michael, and who is helping Helen, build this page. Andrew has spent many years compiling his research on the Whelahan family who left their homeland because of the harsh famine of the 1840/50s. In particular he was trying to trace Michael’s mother who was called Margaret McGinness and whose Irish line is documented at the foot of the page. The Whelahan Clan have their place in Scottish history as one of their sons was the first Captain and one of the founder members of the Hibernian Football Club. His name was also Andrew Michael Whelahan and he was our Andrew’s Grandfather. 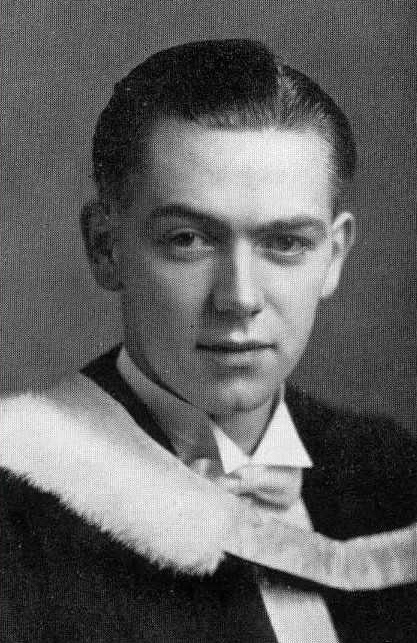 Andrew was born on 11th July 1911 at 16 Chapel Street, Edinburgh, son of Patrick John Whelahan and Margaret McGinness. They also had a daughter whom they named Patricia Whelahan. Andrew Michael had graduated as a Bachelor of Commerce and his chosen profession was an Accountant’s Clerk. He married Margaret (Daisy) McKeon who was a lecturer in Dean College (of Nursing) in Edinburgh and also became the President of the Catholic Nurses Guild. 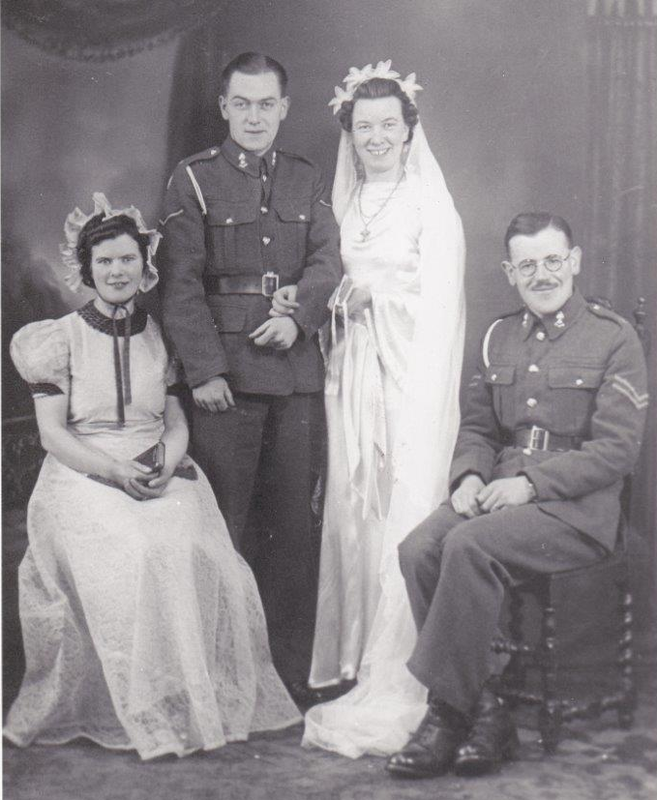 Michael married Margaret on Feb 3rd 1941 in St. Mary’s R.C. Chapel in Bathgate. Margaret was born on February 14th 1918 at 7a Gideon Street in the town. She died on 3rd August 1989 in Edinburgh. Patricia Margaret Whelahan was born on 2nd September 1917, younger sister of Michael. She married Ronald Dingwall Kennedy who was born on 24th December 1912 in Wick in the North of Scotland. Ronald had moved down to Edinburgh to study medicine at the famous Edinburgh University. The couple married on 26th July 1939 at the Chaplaincy in George Square, Edinburgh. Ronald was offered a job as a locum in Fleetwood in Lancashire and this is where their two children were born. Anne Patricia Kennedy born 1940 and Michael Andrew who was born in 1941. In 1942 the family moved back to Edinburgh where Ronald started up as a General Practicioner at 52 Rankeillor Street, Southside, Edinburgh. It was in 1948 that the whole family moved to Kenya in South Africa. After the death of Anne’s grandfather Patrick Whelahan her grandmother Margaret Whelahan McGinness also emigrated to South Africa and stayed there until her death from natural causes in August 1967. THE WHELAHAN’S ARRIVAL IN SCOTLAND Like many Irish immigrants they found themselves in the Cowgate area of the City which was also called Little Ireland. They adopted the local Catholic Church and made it their own, sharing it only with the Italians who had also congregated in the same area. This Church is steeped in our family history and holds many stories regarding our past. St. Patrick’s Cowgate. A bit about Canon Hannon from the Hibernian archives Canon Edward Joseph Hannan was born in Ballingarry, County Limerick in Ireland on the 21st June 1836. He was ordained as a priest on the 13th May 1860 and initially continued his studies, being appointed as a Professor of Classics until, while on holiday in Scotland, he was persuaded by the Bishop responsible for the Church in the East of Scotland to move to Edinburgh. After arriving on the 17th April 1861, he began what would be a 30 year service at St Patrick’s Church in Edinburgh’s Cowgate. n October 1861 Father Hannan, as he was then known, was appointed as a junior curate at St Patrick’s. The Father decided to tackle some of the social problems in the area of the city known as ‘Little Ireland’ by seeking to open a branch of the Catholic Young Men’s Society, an organisation founded by the Father’s uncle, the Right Reverend Monsignor Richard B. O’Brien DD VG, Dean of Limerick, in 1849. He was successful in his efforts and the St Patrick’s branch of the CYMS was officially opened on the 5th October 1865. 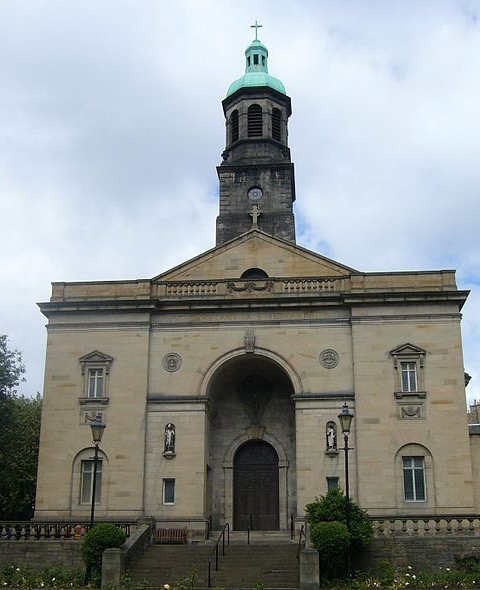 As the branch flourished, Father Hannan approached Edinburgh Corporation and permission was given for the erection of a hall to be called the Catholic Institute but which the people knew as St Mary’s Street Halls. On the 2nd April 1869, the Lord Provost laid the foundation stone for the building which was to play such an important part in the formation of Hibernian Football Club some six years later. Father Hannan became priest-in-charge at St Patrick’s in 1871 and continued his work by expanding the church’s devotional societies, Sunday schools and educational facilities including the building of a new St Partick’s boy’s school. Indeed his work in the field of education was such that he was elected to the Edinburgh School Board. Working closely with Father Hannon was Andrew Whelahan who became the Captain of the First Hibernian Football Team. Two Stanton brothers were also in this team, Patrick and Andrew as was ballboy James Connolly. Andrew Stanton married Maria Whelahan and the family connection started right there with their marriage. Maria helped the boys by washing out their strips. This little piece of history was carried down through the Stanton family until today. THE ROOTS OF THE WHELAHAN FAMILYThe Whelahan family are from the beautiful County Rosscommon in Ireland, an area which today has changed little over the last few centuries. 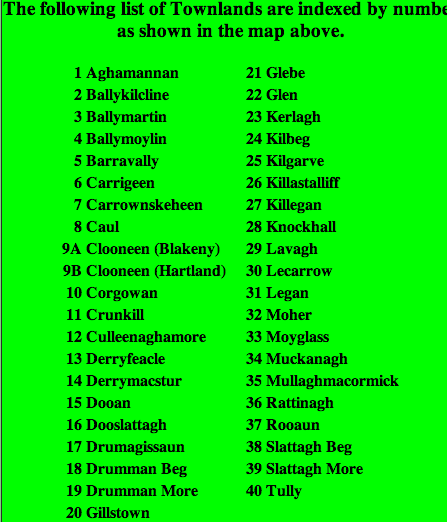 The Place Names appertaining to the map The villages above surround Lough Kinglass in the County of Rosscommon in Ireland. From A Topographical Dictionary of Ireland, 1837 – just before the Whelahan family left the area due to the great potato famine KILGLASS, a parish, in the barony of BALLINTOBBER, county of ROSCOMMON, and province of CONNAUGHT, 5 ½ miles (E. by N.) from Strokestown, on the road from that place to Rooskey; containing 9118 inhabitants. 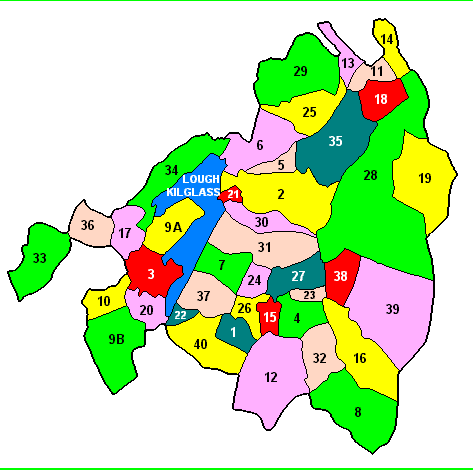 It comprises 7168 statute acres, as applotted under the tithe act, and about 1400 acres of bog: the land is principally under tillage, and there are some quarries of stone. The principal seats are Gilstown, the residence of J. Hogg, Esq. ; Lava, of W. Hanly, Esq. ; Cottage, of M. Hanly, Esq. ; and Doneen, of G. Hogg, sen., Esq. It is a vicarage, in the diocese of Elphin, and in the patronage of the Bishop: the rectory is impropriate in the representatives of Lord Kingsland; the tithes amount to £759. 9. 2., which is equally divided between the impropriators and the vicar. The church, which is a neat structure, was erected in 1826, by aid of a loan of £740 from the late Board of First Fruits, and was recently repaired by aid of a grant of £101 from the Ecclesiastical Commissioners. The glebe-house was built by aid of a loan of £400 and a gift of the same amount from the late Board of First Fruits, in 1813: the glebe comprises five acres. The R. C. parish is co-extensive with that of the Established Church, and has chapels at Kilglass and Mullogh-McCormick. About 40 children are educated in two public, and about 700 in twelve private, schools. Back in Scotland So in Edinburgh we find the Whelahan family. Patrick John Whelahan, son of Patrick Whelahan and Annie Coyne moved to Scotland circa 1850. Patrick had married Bridget McDonald on either 6th October 1945 or on 3rd February 1846 in County Rosscommon. They may have actually married twice and may have been due to the circumstances in Ireland at this time.. These dates are documented by the two different marriage dates on two of their children’s birth certificates. Bridget’s father was Thomas McDonald and her mother was.Mary Kelly. Patrick died on 5th August 1882, 5 College Wynd, Edinburgh. Bridget died on 19th November 1903 at a flat 13 Jeffrey Street, just off the Royal Mile in Edinburgh. The children of Patrick Whelahan and Bridget McDonald. Conn’s Close was situated on the South Side of the Cowgate – an alternative name was Steel’s Close. Elizabeth Whelahan was born in 1864 and she lived until she was 90. She died on 19th August 1954 at 34 East Preston Street, Southside, Edinburgh. Elizabeth married Michael Gilluley [Gilhooley] also at St. Patrick’s Church, Cowgate on 26th August 1890. Michael was a Butcher by trade. There is a family plot in Mount Vernon Catholic Cemetery in Edinburgh. There was also a Gilhooley who played in the first Hibs Football Team and who is photographed with the original team in 1875. The only surviving son of the family was Michael. Michael married Isabella Robertson on 26th July 1883 in St. Patrick’s Church. Their Priest was Edward Cannon. In the 1870s Michael was a member of the Young Catholic Men’s club, associated with St. Patrick’s Church in the Cowgate. This club formed a football team of which Michael was elected Captain and at his suggestion the team was given the name Hibernian Football Club. Marriage with Edward Hannon, Priest and sister Elizabeth Whelahan as Witness. Michael’s Profession as Typefounder was one which he enjoyed for many years. He worked with the design and production of metal printing for hand composition. Many of the Stanton family also were in this profession. Their children came along of course and many of their families enjoyed long and prosperous lives. 2 Cottage Wynd was where Andrew and Maraia resided in 1881. Andrew with birthplace of Mayo and Maria, Rosscommon. Michael died on 20th January 1926 in Chalmers Hospital in Edinburgh. He was 72 years old. Michael is part of the history of Edinburgh. Helen Isabella Robertson died on 19th March 1910. The Children of Michael Joseph Whelahan and Helen Isabella Robertson. Michael was a typefounder by trade. He married Margaret Ash McKeon [aka Daisy] but his premature death during WW2 on 23rd December 1941 in North Africa left her a very young widow. Michael was serving with the Royal Artillery when he was very sadly Killed in Action. He was buried in El Alamein, Matruh, Egypt. He was described as Bombadier Michael Joseph Whelahan on the official cemetery documentation. Their daughter Patricia Margaret Whelahan was born on 2nd September 1917 . Patricia married Ronald Dingwall Kennedy on 26th July 1939 in the Chaplaincy in George Square, Edinburgh. Ronald was born on 24th December 1912 in Wick in the North of Scotland. He studied Medicine at Edinburgh University and this area is also in the Southside of Edinburgh where the Whelahan family lived. They most likely met in the area. After their marriage Ronald was offered work as a locum in Fleetwood in Lancashire. So the couple moved down to England. It was here their two children were born. Anne Patricia Kennedy born in 1940 and Michael Andrew Kennedy in 1941. 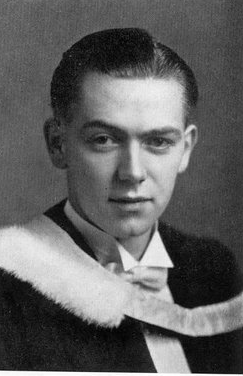 The family returned to Edinburgh in 1942 where Ronald started as a G.P. at 52 Rankeillor Street, Southside, Edinburgh where the family also resided. For whatever reasons Ronald and Patricia moved to South Africa with their children in the year 1948. Ronald died in 1959. Anne tells us that after the death of her grandad Patrick in 1959 her grandmother Margaret Whelahan McGinness went over to live with her family until her death from natural causes in August 1967. Margarita Whelahan married James Devlin – b. 1886 at 211 Cowgate, Edinburgh. She died 1962 at 6 Headrigg Row, Newington, Edinburgh. Margaret was a bookkeeper pre marriage. She married James Devlin on September 19th 1910 St. Patrick’s in the Cowgate. James was the son of Patrick Devlin and Mary Harkins. The Harkins family had a RELIGIOUS BOOKSHOP in Edinburgh for many years. 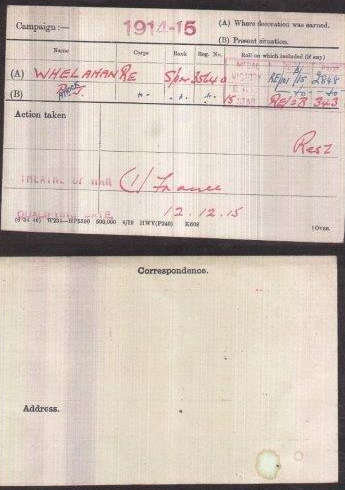 James’s occupation in 1910 was Grocer and Wine Merchant. Birth Eileen Isabel Devlin. Address 7 East Adam Street, Edinburgh. Isabella WHELAHAN BORN in the Cowgate in 1891. She died on 6 October 1940 of Tuberculosis. She married Charles Campbell who was a Blacksmith by Trade. Rumour has it that they were in fact never married. But on her Death Certificate she certainly describes herself as Isabella Campbell.. They had one daughter, Agnes Campbell, who was a school teacher, who also died from TB. GEORGE ALEXANDER WHELAHAN was born in 1918. 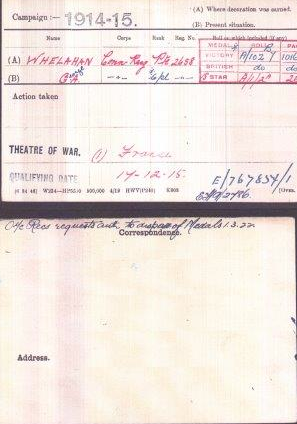 – he died during World War I, 21st March 1918, in Flanders, France. He is buried Templeux-le-Guerard, British Cemetery. Kathleen Bridget WHELAHAN was born 8 June 1897. 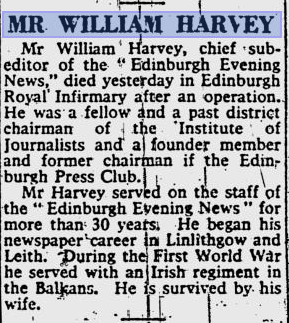 She married William Harvey on 26th July 1933 at St. Columba’s R.C. in Upper Grey Street in the Southside of Edinburgh on 26th July 1933. Her uncle Michael Whelahan was the Officiating Priest. At the time he was officiated to St. Bride’s Church in Cowdenbeath but must have come back through to Edinburgh to marry his sister. Kathleen’s new husband was a journalist and worked for many years as a Sub Editor, Evening News. HE died 1993. Kathleen died in 1993 at home at 71/2 Liberton Park Court in Edinburgh of general old age. She was 96 years old. Her great neice K.A. Smith was informant at her death. Father Michael Whelahan, b. 1889, educated Blairs 1905-07, ordained Catholic Priest in 1917, Our Lady of Perpetual Succour in Kikcaldy, 1912-1914; Haddington 1924-25; Armdale 1925-32; Cowdenbeath 1932-36; Lennoxton 1936-49. Died Lourdes 11 Sep 1949. This branch of the McGinness family had also come to Scotland around the time of the great famine. Margaret was from a large famiy and they had settled in the ‘southside’ of Edinburgh in the Buccleuch area which is around the University area today. This branch of the McGinness line starts back in Ireland circa 1775 with Daniel McGinness and Mary Cane. 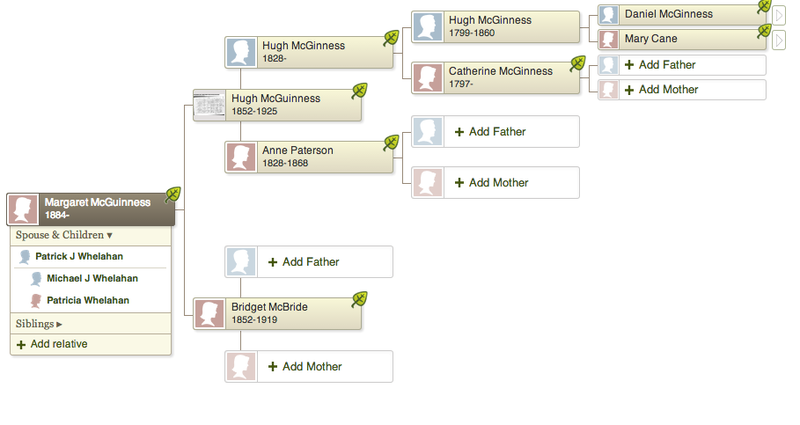 Their son Hugh McGinness born 1796 married Catherine…….. and they have four children, Anne, Hugh, Charles and Margaret . The 1851 Scottish census tells us that the family had arrived in Scotland were resident in the Kirkcaldy High Street in 1851. The same census tells us that both Hugh and his wife Catherine were born in County Down in Ireland. Margaret was born in Shotts in Lanarkshire in the year 1842. She was the youngest and by now the rest of the family had moved on. Their son Hugh went on to Marry Anne Paterson. Children Hugh, John James and Michael were born in Edinburgh in the 1850s. So Hugh who was born in 1852 then goes on to Marry Bridget McBride in 1869 . 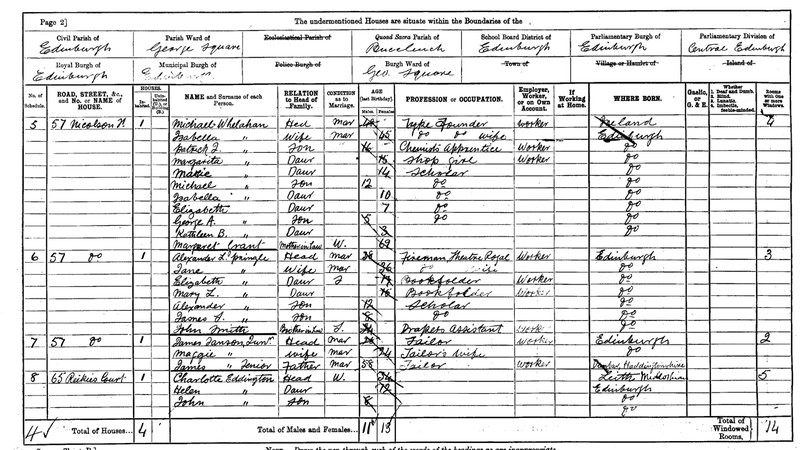 Hugh was described as a Woollen Merchant in the 1891 Scottish census, The family were resident at 5 South Oxford Street in the Southside of Edinburgh. The flats here are large open houses and not like the squaller of the Cowgate. 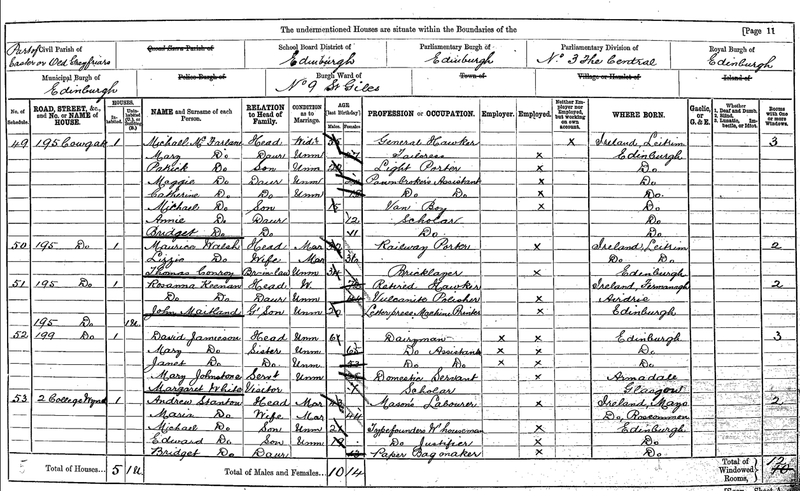 As the years rolled by their large family were born and as we can see from the same census they had a resident servant.
. His father John Hanley, it appears was born in Leitrim, but still to be proved in a documentary sense. The Hanley family eventually took up residence in West Nicholson Street and it is clear Margaret Hanley, now Mrs. McKeon and living in Bathgate kept in close touch with her former neighbours. It was through this contact that she effected the romance between her daughter Margaret (known as Daisy), born 1918, with Michael Whelahan, born 1912. Michael, lost in action at Tripoli in 1941 was the third generation of Whelahans to serve in the British armed forces. This, as well as the Hibee connection is interesting. A missing piece of the genealogy gigsaw was Michael’s mother, who I have just found out was on her way to Cape Town in the year 1960 when she died en route. What a great adventure for one at the age of 76. Her daughter Patricia and her husband had moved there for a while in connection with her husband’s job. I was born in Linlithgow in 1938 and in 1948. I plugged school and managed to join my father and his friends on their way to Easter Road to see Hibs v Airdrie. I was lifted over the turnstile. Daisy had an important role in my wife Claire’s life, as she was most supportive of Claire’s mother who brought up her four children as a single mum, so it is fitting that there is some tribute to her. I have attached two images and will go through the old family album to see if there are more in connection with the Whelahan’s, but of this we are not sure. The other minor mystery is the identity and role of Michael’s best man, the informant of the older Michael’s death and possibly that of Elizabeth’s. I have traced his death to Elgin, here in the North East of Scotland, and will see what I can glean from his death cert. when I can get back to Edinburgh.